A late penalty by Milan Baros gave Villa a derby victory that maintains their impressive recent form. Villa dominated the first half with Luke Moore hitting the bar but they did not take the lead until after the break when Steven Davis headed home. 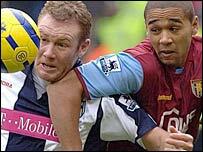 West Brom took time to respond but hit back when Steve Watson drilled home from a Jonathan Greening free-kick. But when Watson handled a Gareth Barry free-kick in the box, Baros stepped up to slot home the winner from the spot. It was West Brom's fourth defeat in their last five Premiership games, while Villa have moved in the opposite direction in the table after picking up eight points from their last four outings. The Baggies created the first chance, when Greening was just unable to turn the ball in at the far post after good work from Diomansy Kamara and Nwankwo Kanu. But that was as good as it got for Bryan Robson's side in the first 45 minutes as Villa slowly but surely took control - creating a host of chances. Moore hit the bar from close range and a goalbound James Milner shot was deflected wide before Tomasz Kuszczak produced a spectacular save to keep out Gavin McCann's first-time shot from the resultant corner. Another Villa corner caused more havoc in the Baggies defence soon after, and Mark Delaney threw himself at Olof Mellberg's downward header only to see the shot fly high over the bar. Somehow West Brom survived at 0-0 until the break, but Villa did not have to wait long before they did find the net in a move started and finished by Davis. His through-ball was not dealt with by Neil Clement and the ball was fed through to Milner who jinked his way to the byline before crossing to the back post where Davis arrived to head home. It was no less than Villa deserved, while at this stage the Baggies were unable to find any sort of response. It was only in the last 25 minutes that the home side began to threaten, and at last the game sprang into life. First Villa's stand-in goalkeeper Stuart Taylor had to tip over a dipping Greening cross, then West Brom had loud shouts for a penalty turned down when Aaron Hughes handled inside the area. Taylor had to dive to keep out a Kamara header but he was at fault when Watson made it 1-1 on 76 minutes, failing to deal with Greening's cross. It looked like the Baggies had done enough to earn a point, but with 10 minutes left, referee Rob Styles pointed to the spot when Watson blocked Barry's goalbound free-kick with his arm. Baros converted the penalty and ensured that Villa got off to a winning start in 2006. "All the way through the game we had to wait for the whistle with free-kicks yet on that one he lets Villa take it as quickly as they want. "It seems to be one rule for one and one for another and it cost us dearly. "We had Villa on the back-foot so it was disappointing to lose like that." "We played well. Full credit to the players. "It was a great effort by them because they were tired. Without a doubt we deserved to win, but we should have won by more in the end. "We made a good start to the second half then sat back a bit and gave away a silly goal. But we settled back down and scored again." West Brom: Kuszczak, Albrechtsen, Curtis Davies, Clement (Horsfield 83), Robinson, Kamara, Watson, Carter, Greening, Kanu, Ellington (Campbell 88). Subs Not Used: Moore, Kirkland, Chaplow. Aston Villa: Taylor, Hughes, Delaney, Mellberg, Barry, Davis, Bakke (Angel 62), McCann, Milner, Moore (Gardner 85), Baros. Subs Not Used: Djemba-Djemba, Ridgewell, Henderson. Goals: Davis 47, Baros 80 pen.